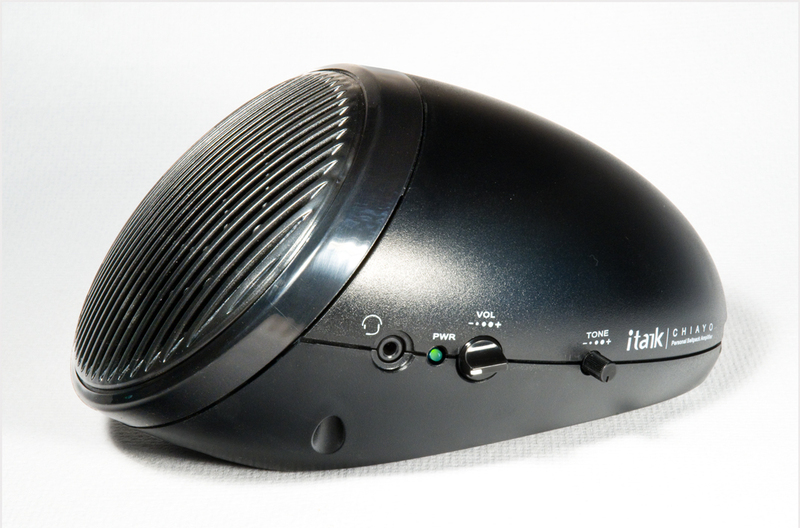 An example, using HiSpeak with an iTalk loudspeaker (sold separately). Michelle was caring for Josh who had advanced Muscular Dystrophy disease. Once he needed to use the CPAP mask 24/7, Josh became a bit more isolated. The loudspeaker could at least restore a small amount of the independence Josh had lost. Four rechargeable AA batteries can be fitted. The iTalk loudspeaker is supplied with a charger; note that authority approval would be required for charger use in some oxygen-rich hospital environments. This unpleasant feedback squeal can occur if the microphone is not completely sealed to the mask. Once this is understood, it is quite manageable/preventable. Michelle and Josh came up with an inventive arrangement where the iTalk loudspeaker was hung from an intravenous mast, using a modified re-purposed stocking. Michelle found the loudspeaker was best positioned a short distance from Josh in the hospital room environment to get good sound quality, and to facilitate a more normal conversation situation. The system performed well with Josh in an outdoor environment in his wheelchair; in this case, Michelle positioned the loudspeaker close to Josh’s head; partly to reduce the equipment’s visibility, and partly to get more natural communications. Josh could also initiate conversations with people in the hospital corridor, (assuming they had made eye contact with him). When in public, people could be unduly fascinated by the apparatus, so Michelle endeavoured to tuck it out of sight. The iTalk (sold separately) is not a ‘cheap’ loudspeaker, and it has truly proved to be the most competent portable loudspeaker we have tried, because of the sound quality and the ten watt power output rating. It is important to note the comments above on managing acoustic feedback.